Chef Dan was born in Indianapolis Indiana. He attended Johnson and Wales University of Culinary Arts in Providence Rhode Island. 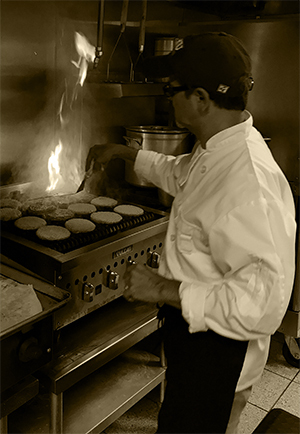 Upon graduating he accepted the position of Executive Chef at Many Glacier Hotel/Resort in Montana. After two years in was then offered a position as District Executive Chef in Middle Tennessee. He did this for four years. He then decided to form a Food Service/catering company with a partner which they did successfully for ten years. Dan was then presented with the opportunity to do the Foodservice at St. Bernard Academy in 2007. Dan enjoys sports, and all outdoor activities. He can also be found horseback riding, attending movie theaters and enjoys world history. Dan enjoys sports, and all outdoor activities. He can also be found horseback riding, attending movie theaters and enjoys world history.